Wombi Ice Cream - Make your own ice cream cone! One of the BEST iOS APPS of 2012 according to The Telegraph! "APP of the DAY" - MACWORLD! The customers line up outside of your ice cream truck and you have to now make lots of ice cream! Will it be in cups, cones or bowls? And what flavors? And don’t forget all the toppings, sprinkles and delightful decorations! Drag, point and click and create the tastiest ice cream ever! And last but not least – see what your customers think about the ice cream! - Five different cups, bowls and cones! - Choose between twelve fantastic ice cream flavors! - Lots of toppings and decorations! - Six different customers with new requests every time! 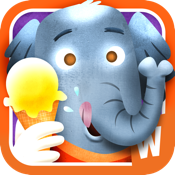 Wombi Ice Cream is suitable for kids 4 and up.